What s the best strategy to get hired as a firefighter? I was asked this by a prospective firefighter today. He asked if it would be more beneficial to pursue his EMT – intermediate or go to a fire academy and get his firefighter 1 and other basic certifications. I listened as he explained the pros and cons of each, and then explained that if he wanted to get hired soon, he should go for the intermediate. There are 2 reasons for this. MANY departments will put new firefighters through their own academy. Secondly, having the intermediate makes you an advanced life support provider. This makes you extremely marketable. In the last 10 years many departments have moved to mostly ALS units. The natural turnover and specialized education of intermediates and paramedics usually means high demand for als provides. So if you’re looking for a great way to get a job as a firefighter, go get your emt intermediate, or go big and get your paramedic. When I was a new fire lieutenants the best piece of advice given to me was to “keep your head”. What on earth does that mean? It means you’re going to encounter situations in which you’re not sure what to do. Keeping your head means understanding your role. As a fire lieutenant your job is to bring a sense of calm to a chaotic situation. If you panic, your crew will panic, the bystanders will panic, the next in company will panic, so on and so forth. In some cases just making a decision is half the battle. It doesn’t have to be a perfect decision. The fact that you are doing something vs standing outside panicking, is going to go a long way. 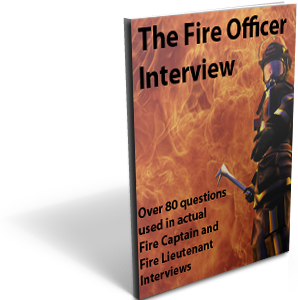 Daren, recently purchased our fire officer interview questions e-book in preparation for his lieutenant oral board. After his interview he emailed us telling us our guide had 7 of his 10 questions in it. This was one that was not in our guide, but is now. Its a great question and allows the panel to gain insight into a candidates thought process on risk/reward and safety. You arrive to a single story single family residential home with light smoke showing from basement windows. The basement windows have metal security bars over them. The fire appears to be in the incipient stage and there is not an exterior stairwell. What will you do? This is a great interview question that has to be answered carefully. It presents a picture of a small fire in the basement that should be easy to handle. The point of this question isn’t to see if the candidate has his strategy and tactics down, but rather his view of safety. If he makes an offensive attack, will he have a secondary means of egress? Is this allowed within your department’s SOPs? The panel will watch for a risk/benefit analysis, a careful size-up, and a plan to operate safely. A defensive attack is acceptable in this case as long as no life hazard can be confirmed. However, the most appropriate answer is to have a RIT in place, and a truck crew working on removing the bars when the attack begins. Either way, as long as the candidate mentions the security bars as his concern the panel will most likely be happy. 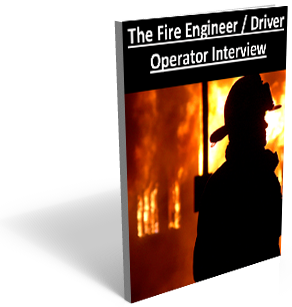 Yes, this question has been added to our Fire Officer interview questions e-book. Welcome to the updated myfirejob.com. We have converted our site into a blog. All of your favorite pages are still available. The firefighter job listing is by far our most popular page, and can be found on the right side of your screen. We will continue to update the listing as often as possible. 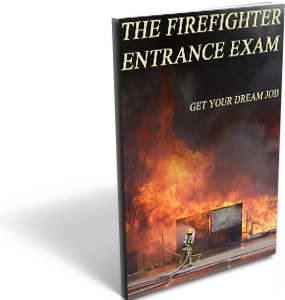 Our goal is to prepare you for the firefighter entrance exam, and future promotions. Feel free to look around and provide your feedback.